Lieut. John C. TurnbullJuly 2d Engaged on Emmitsburg Road on right of the Smith House. July 3d On and near Cemetery Ridge. Lieut. Evan ThomasJuly 2d and 3d Engaged on Cemetery Ridge on left of Second Corps. Lieut. Gulian V. WeirJuly 2d and 3d Engaged on Cemetery Ridge and in front on left of Second Corps. Casualties. Killed 1 officer 12 men. Wounded 4 officers 49 men. Captured or missing 2 men. Total 68. Location. 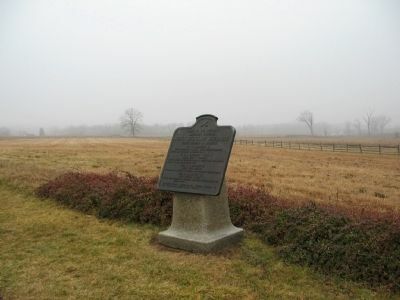 39° 48.46′ N, 77° 14.152′ W. Marker is near Gettysburg, Pennsylvania, in Adams County. Marker is on Hancock Avenue, on the left when traveling north. Touch for map. Located in near the Pennsylvania Memorial on Cemetery Ridge in Gettysburg National Military Park. Marker is in this post office area: Gettysburg PA 17325, United States of America. Touch for directions. Other nearby markers. At least 8 other markers are within walking distance of this marker. Battery C, Fourth U.S. 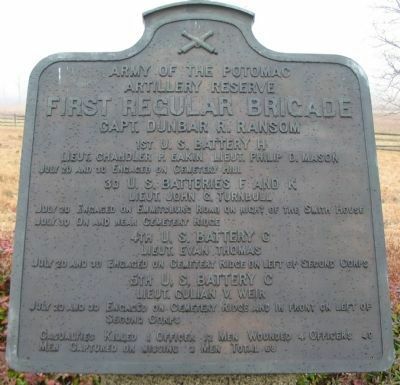 Artillery (a few steps from this marker); Ninth Michigan Battery (a few steps from this marker); 17th Maine Infantry (within shouting distance of this marker); Battery A, 1st New Jersey Artillery (within shouting distance of this marker); Pennsylvania Memorial (within shouting distance of this marker); a different marker also named Pennsylvania Memorial (within shouting distance of this marker); Batteries C & F, Pennsylvania Independent Light Artillery (within shouting distance of this marker); New Hampshire - Berdan's Sharpshooters (within shouting distance of this marker). Touch for a list and map of all markers in Gettysburg. More. Search the internet for First Regular Brigade. Credits. This page was last revised on June 16, 2016. This page originally submitted on February 28, 2009, by Craig Swain of Leesburg, Virginia. This page has been viewed 788 times since then and 9 times this year. Photos: 1, 2. submitted on February 28, 2009, by Craig Swain of Leesburg, Virginia.